Original photo uploaded by Alter Reality Games. November 30th, Donald E. Stephens Convention Center, Illinois. The first of ARG's renewed Cardfight!! Vanguard tournaments has ended with YouTube celebrity Robbie Kohl taking first place with Revenger Phantom Blaster “Abyss.” Runner-up at ARG was Christian Maldonado playing a Cosmic Regalia CEO Yggdrasil deck. This was the first Cardfight!! Vanguard tournament to be held after the shift to legion format on November 21st, and the results reflect general shifts observed in card shops throughout North America. Professional cardfighters are favoring Yggdrassil and “Abyss,” with Genesis and Shadow Paladin's witch subclans as close competitors to the more mainstream Regalia and Revenger decks. Like a number of Japanese cardfighters, Kohl built his “Abyss” deck with the Mordred Phantom break ride as his secondary grade 3, creating the potential for an overwhelming 32000+ power restanding attack at endgame. Many opponents when confronted with such a deck meet it by trying to control the “Abyss” fighter's damage and keep them out of limit break. However, this tends to keep those fighters at higher damage than their opponent, with the typical response being to ride into “Abyss” without waiting to break ride and go straight for his restanding legion skill the moment the opponent is in the 4 damage range. Kohl won $200 in store credit for his victory, with prizes for the rest of the top eight descending from $100, to $75 and down to $25 for fourth through eighth place. The Chicago tournament was put together on short notice compared to the rest of ARG's events that weekend, and drew 34 participants. The top four cardfighters at Chicago were Robbie Kohl with Blaster “Abyss,” Christian Maldonado and Lance Bow both playing CEO Yggdrasil, and a currently unknown fighter with Duo Temptation Reit. Kohl defeated the Bermuda cardfighter before advancing to the finals against Maldonado. A Great Nature fighter was commended by those that made the top cut for placing inside the top eight. The tournament's top cut was streamed to ARG's Twitch channel, attracting over two hundred viewers during its run. Commentary was provided in-house. The full video of the top eight playoffs will be posted to their YouTube channel later, but for the time being one of our editors recorded the decisive third game between Kohl and Maldonado. 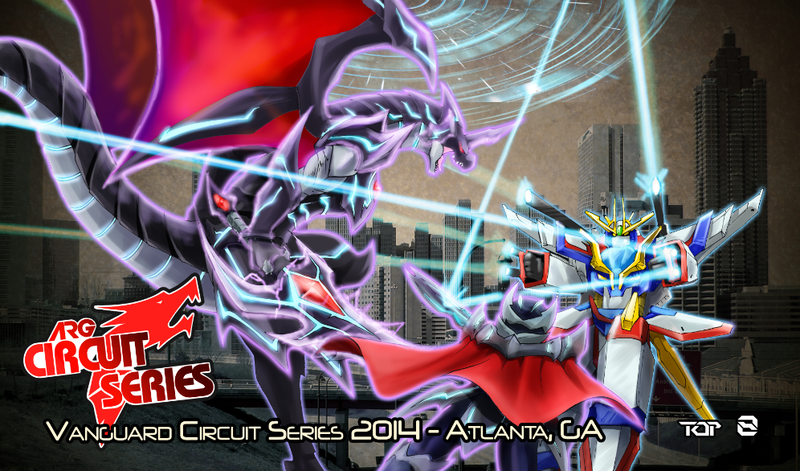 Followup tournaments for the ARG Circuit will take place on December 7th and January 4th in Atlanta and Orlando. Decklists are expected to go out this week. In his games with Maldonado, Kohl focused on aggression to draw out early defense from his opponent, making it more difficult to guard the Judgebau-boosted Phantom Blaster later on in the match. Maldonado responded by trying to draw the same guard out from Kohl by attacking his rearguards, leveling the playing field but not overtaking Kohl in the card advantage game. Kohl took advantage of this by punishing his opponent with further rearguard swings, securing his on-hit, but an unfortunately timed heal trigger locked him out of using Judgebau to go into double Sword Breakers. With very little in the way of card advantage and soul setup, Maldonado was quickly backed into a corner, leading him to use an early quintet wall to provide a pool of cards to soulcharge out of the drop zone off Hemera and Shiny Angel. 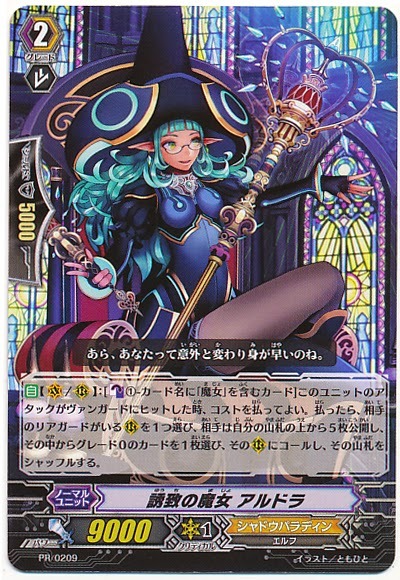 However, Maldonado had chosen to open with Minerva to serve as an additional card in the soul for Yggdrasil and early crossride defense, and this proved costly as it locked him out of using his legion-based starter Pray Angel to soulcharge; Kohl capitalized on this by using Blaster Dark Revenger “Abyss” to retire it, limiting Maldonado's soul options for the rest of the game. This play proved critical, as it stopped Yggdrasil's soulblast 6 from being used a second time. By the time Maldonado rode Yggdrasil, these plays had snowballed into a ten card difference in advantage for Kohl, and Maldonado was left with just two cards in hand. Because of the third game's emphasis on prevention and damage control, it ended without Kohl using his restand skill, winning instead by brute force and capitalizing on early leads so that he ended with upwards of twelve cards in hand even as the game finished. In addition to his breakthrough as a professional cardfighter, Kohl has been instrumental in helping to organize the Circuit series, working closely with Alter Reality Games to revitalize Cardfight!! Vanguard tournaments in the United States. He has previously experienced some success as a duelist in Yu-Gi-Oh!, and volunteered to help set up tournaments with ARG after their call for organizers last October. The Japanese card of the day for the weekend is Meteor Kaiser, Vict Plasma. 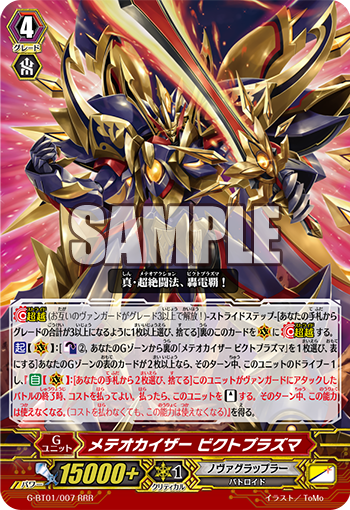 Illustrated by ToMo (Perfect Raizer, Death Army Bishop, Maximum Raizer) the card is Nova Grappler's triple rare G-unit for VG-G-BT01: Generation Stride, and the first restanding stride to be introduced to the game. Vict Plasma is accompanied by Meteor Kaiser Vict Ten, with the two Meteor Kaisers acting as successors to both of Nova Grappler's iconic past decks, Asura Kaiser and Stern Blaukluger. Vict Plasma's main phase counterblast 2 requires him to both turn a copy of himself face-up in the generation zone and then have two or more face-up cards in that zone. While Nova Grappler has a bevy of unflipping support in Clay-doll Mechanic, Hungry Dumpty and Super Electromagnetic Lifeform Storm to support the counterblast with, without any way to turn stride units face-down Plasma is fundamentally limited to going off twice. In exchange for reducing his triple drive down to a standard twin drive, Plasma can then restand once after his first attack by discarding two cards. Because the drive check is reduced by one, the potential of a restanding G-unit is severely curtailed in Plasma's example, and taking both the drive reduction and the discard cost necessary to stride into account, Kaiser will always create at least a net -1 in card advantage. He would make for a much more intimidating unit if he retained triple drive, but the power boost from striding ensures that Plasma will always swing in the range of ~26000 power, putting him a cut above past restanding vanguards like Raging Form, Thing Saver, Cat Raizers and “Abyss” who were always restricted to ~21000 power unboosted. Plasma is accompanied today by the second Meteor Kaiser, Vict Ten. 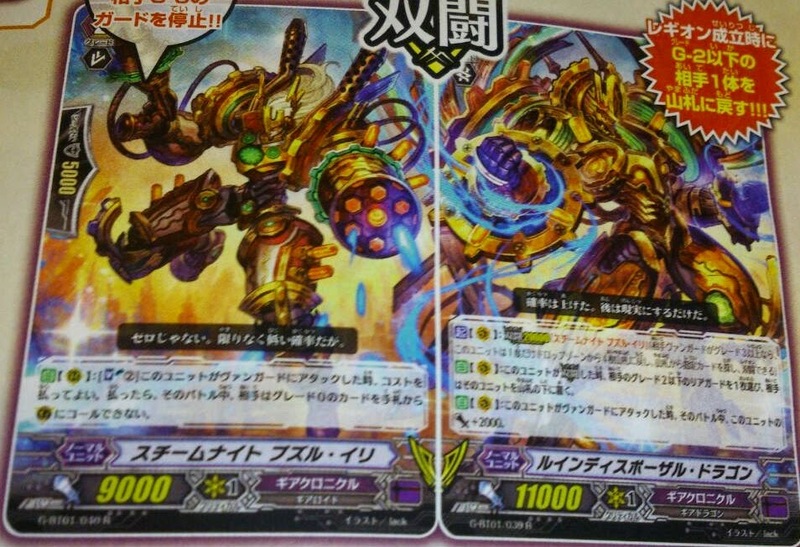 As noted in the R&D discussion for these cards, Vict Ten is intended to be used with Mecha Battler Victor, combining Victor's on-stride skill with his own to stand two rearguards and give them +5000 power each. Victor's skill lets Ten counterblast 1 to stand a rearguard and give it a power boost, while Ten's on-hit stands another rearguard with the same boost, which can create either a single 26000 power lane or two ~16000 power lanes without triggers. Ten is intended as a primary early game stride unit, used to send the opponent to four damage faster so that Plasma can safely come out and overwhelm them with his restanding skill. Victor's on-stride is less useful for Plasma than Ten because while it can be repeated to a similar effect with his restanding skill, doing so would require a total of 4 counterblast. On the other hand, running Clay-doll Mechanic can make this a non-issue, by using Mechanic to unflip the damage next turn and make sure that you can take advantage of Vict Plasma's restand a second time. Beginning this weekend, Ohio-based card shop Alter Reality Games has announced the return of Cardfight!! 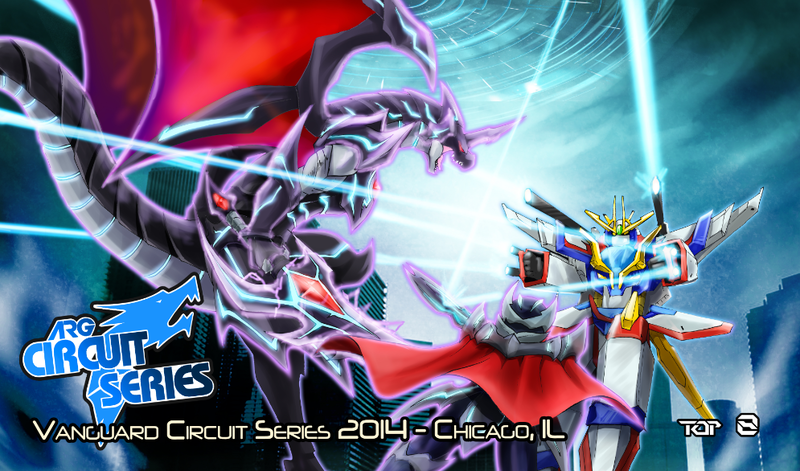 Vanguard to its Circuit series tournaments. Cardfight!! Vanguard will join Magic: The Gathering and the Yu-Gi-Oh! trading card games as part of ARG's featured games. To promote the Circuit series ARG is introducing its own line of playmats, with the three introduced today featuring the characters Phantom Blaster “Abyss” and Great Daikaiser. Each of the playmats has the name of the event it will be distributed at printed on it, as well as the skyline of the city the event is to take place in. Atlanta's playmat bears the SunTrust Plaza skyscraper in the background, while Orlando's shows the Cinderella Castle at the Magic Kingdom behind “Abyss.” Each of the three tournaments scheduled is described below, with links to their events page. The finals from each tournament will be streamed by ARG on their official channel, allowing viewers to watch the top cardfights compete live. Each Circuit event will use a best-of-three games ruleset, with Swiss round pairings. Vanguard tournament organization at ARG is currently being handled by YouTube celebrity Robbie Kohl, known for his impact in the Yu-Gi-Oh! community. With over fifty thousand subscribers Kohl is a relatively high profile figure in the west, acquainted with past Vanguard stars like the first world champion Brandon Smith. Kohl volunteered to help run the tournaments after ARG made their previous call for tournament organizers, but the events remain shorthanded where judges are concerned. ARG is still in need of judges for Cardfight!! Vanguard tournaments, so if you are available for either the Georgia or Orlando Circuits described below please send an application to jim@alterealitygames.com. Set to take place on Saturday November 30th, ARG Chicago will be held at the Donald E. Stephens Convention Center in Rosemont Illinois. The entry fee will be $20, and cardfighters that enter the tournament will receive five booster packs for entering. First place will win $200 in store credit at ARG, which can be used on their official website to purchase cards, booster boxes and other supplies. Second place will win $100 in store credit, third and fourth will receive $75 in store credit, and fifth through eighth place will win $25 credit. The top 8 cardfighters will each receive a playmat, but due to holiday delays these may arrive late and have to be mailed to the players. The prizes described assume a 16 player turnout; if more than 40 fighters participate, prizes will be handed out in cash. Each round will have a 45 minute time limit, registration for the tournament will begin at 10:00 AM, and the tournament itself will start at 11:00 AM. The tournament will follow Bushiroad's Comprehensive and Floor rules, with some additional rules established by ARG, and modifications made to adjust the tournament for a Swiss format. ARG Atlanta will take place on Sunday December 7th, and will be held at the Georgia International Convention Center. The same entry fee, prize and tournament rules from Chicago will be used at Atlanta, with a total of $550 being distributed among the winners, and a tournament-specific playmat being given to the top 8 fighters. Atlanta is still in need of judges, so if you are able please apply to jim@alterealitygames.com. 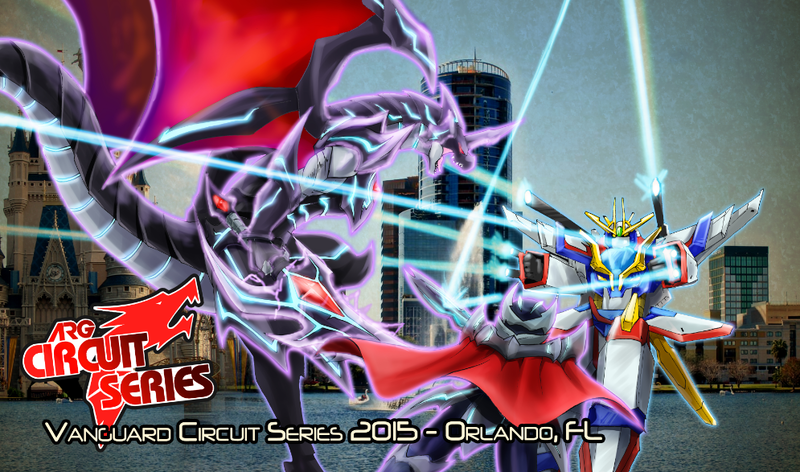 ARG Orlando is set to take place on Sunday January 4th, and will be the first Circuit series tournament of 2015. It will be held at the Ramada Gateway Hotel in Kissimee, Florida. Orlando is still in need of judges, so if you are able please apply to jim@alterealitygames.com. Witchcraft is a parasitic practice. It is created by, then preys on its mother society. So it goes for Shadow Paladin's witch subclan, a build that relies on the opponent to create its own worst enemy. The witch series specializes in punishing unwary opponents for not respecting its skills, making them regret defending while also turning every rearguard called into a bad one, and thinning the triggers from the opponent's deck. VGE-EB11: Requiem at Dusk, released over the 21st, formally introduced the subclan to the English-language format, but the problem for first adopters of the deck lies in justifying a subclan which has done nothing professionally after half a year in Japan. 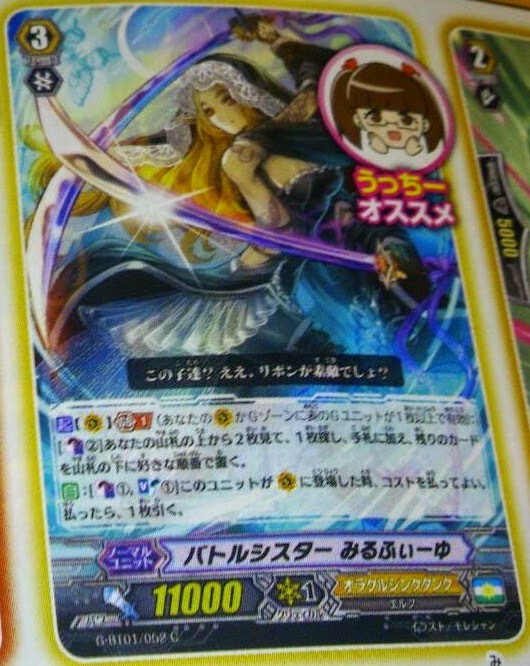 The focus for Shadow Paladin's witches is on grade 0 manipulation, and this extends beyond mainstream Shadow Paladin's capacity to superior call grade 0s to fuel retire skills; the witches can also cast spells that transform the opponent's rearguards into grade 0s. 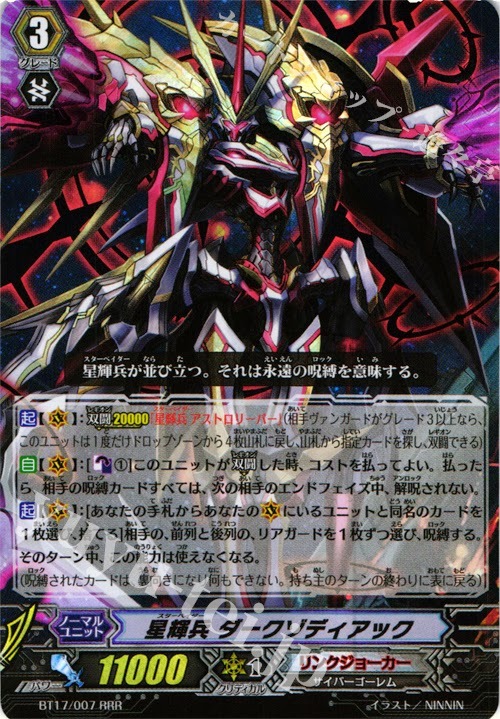 This gives a form of true field controlling surpassing its aggressive counterparts Kagerou and Narukami, which allows you to effectively punish the opponent for guarding, lock them out of recycling trigger units through legion, and deny them of their key rearguards while ensuring that their lanes can't actually deal damage to your own vanguard. These come at lower cost compared to retire and lock skills, in exchange for being highly conditional and occasionally dependent on chance. One of the serious weaknesses of the subclan is its dearth of alternative boss cards. Both the grade 3 lineup and the pool of grade 2s that they legion to reflect this. Virtually every witch deck has an identical strategy because there are no good options outside of Mesmerizing Witch Fianna and Cultus Witch Rias. Fianna is the primary early to midgame boss for the deck. She has a once per turn Nemain-like advantage skill built into her, retiring a unit with a same name as one of the vanguards to draw two cards. Because of her wording the possible retire targets for this expand from three to six the moment she is in legion, but the primary use is to retire extra copies of herself to draw more cards than you sacrificed and build towards having four cards in the drop zone to initiate legion with. While in legion, Fianna gains a second skill. 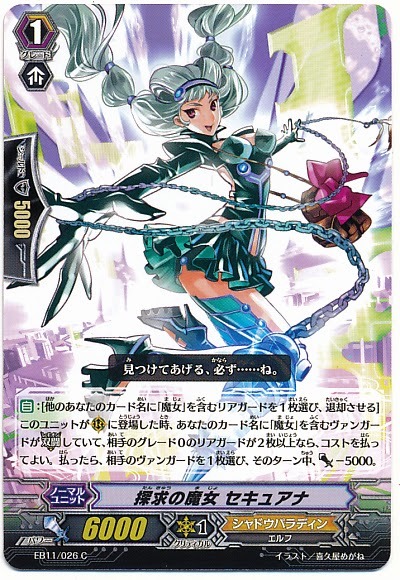 For counterblast 2 she can reveal the top ten cards of the opponent's deck and force the opponent to call two grade 0s over two occupied rearguard circles of your choice, sending the original rearguards to the drop zone in the process. This skill remains useful throughout the fight as a means to consistently weaken the opponent's rearguards, and over multiple turns can reduce them to swinging with 10000-power rearguard columns. 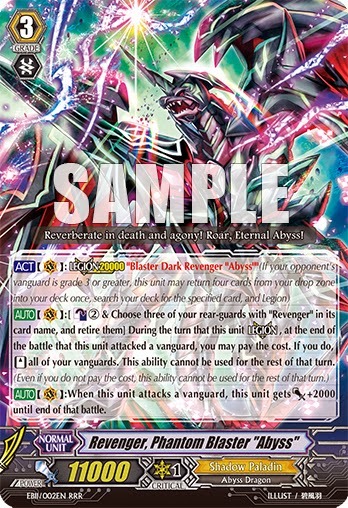 If they choose to call over the grade 0s with new rearguards during their own turn, then for counterblast 2 you've effectively retired two units of your choice at no extra cost while also removing trigger units from the deck--a level of control that Narukami could only dream of. However, Fianna is an extremely costly unit to use, and effectively only activates twice per game under the current circumstances we've described. The witch subclan does have unflipping options that make her substantially more viable, but as discussed further down these options may not be to every fighter's liking. The subclan's secondary grade 3, Cultus Witch Rias, is ideal as a finishing play because her primary skill only activates at the moment that she performs legion. 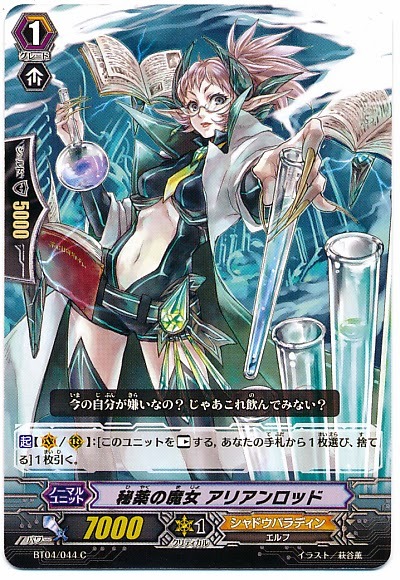 Prior to that point she can counterblast 2 to reveal the top 5 cards of the opponent's deck and have them call a grade 0 over a unit of your choosing, but this is primarily a way to make up for missing your Fianna turns or the opponent replacing their rearguards during their preceding turn. Rias' on-legion skill retires one of your own witch rearguards to reduce the opponent's power by -5000 for each of their grade 0 rearguards, at the minimum giving the mechanical equivalent of a Soul Saver Dragon power boost to your own field. Rias can easily surpass the likes of “Яeverse” Daiyusha and other power-decreasing cards by using her skill when the opponent has three or four grade 0s in play, reducing the typical 11000 power base to -4000 or -9000 power. The fact that negative numbers can come into play alone makes her a highly compelling grade 3 option, as with four grade 0s on the field those 19000 power lanes from subclan attackers will be very relevant, requiring ~20000 shield to block. It's telling that even in Extreme Fight format, Rias is the most popular grade 3 option when all of the Genesis witch bosses are on the table. While Fianna and Rias are both solid grade 3 options, a chief obstacle to the witch decks is the need to support their counterblast costs and make rearguard formations that can compensate for these cards not having innate power skills. Other legion vanguards of the format will attack for at least ~22000 power to demand high shield counts from the opponent, but all of the witch legions at this time are limited to 20000 power exactly, which on the typical defense is no different from a 16000 or 18000 power lane. The intended first vanguard for this Shadow variant is Witch of Banquets Lir, but Creeping Dark Goat is also viable for this deck. Generally your choice of FVG will swing based on your trigger lineup. Lir's skill lets you put her into the soul to search the deck for two grade 0 units and call them at rest after she boosts an attack that hits while your vanguard is in legion and if the opponent has at least two grade 0 rearguards. 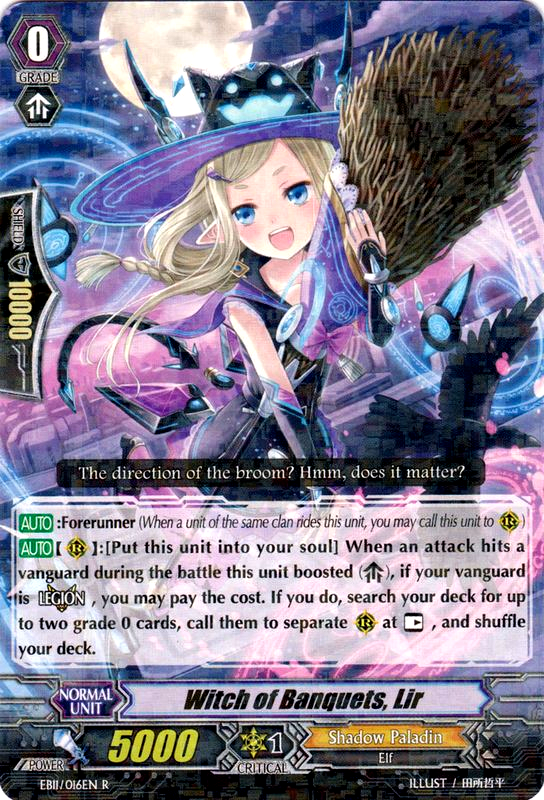 This may appear useless on the surface, as it's a +1 that removes trigger units from the deck, but the rationale behind Lir will become more clear when you consider her potential call targets. The witches as a whole do not require especial counterblast, which gives them access to the entire gamut of Shadow Paladin triggers. That means you can do things like 4 draw 8 critical lineups with three types of draw and five types of critical trigger to deceive the opponent into thinking it's 6 draw 6 critical. However, witches also have access to the first skilled trigger unit in Shadow Paladin, Witch of Goats Medb. Medb is a stand trigger that when placed on the rearguard can soulcharge 1 to unflip a damage if the opponent has two or more grade 0 rearguards, and if you have a witch vanguard in play. The soulcharge skill is useful because of how dependent the witches are on utilizing the soul to pay for costs, and two Medb can be searched out by Lir's skill, building soul and card advantage so that Medb can be sacrificed for retire skills later on. As witches are already very effective at drawing cards and cycling through the deck, you can effectively substitute Medb in for draw triggers to offset the high counterblast costs of the deck's boss cards. It may be tempting to run a rainbow setup of triggers with 4 heal 4 draw 4 stand and 4 crit, but as a whole the combination of stands and critical triggers are a more cohesive way to fight when your deck already has draw power built into it. Critical triggers will get the opponent to the point where stands are the most dangerous trigger in the game faster than draws will. Witches do not have their own perfect defense card, but do have a quintet wall, Barrier Witch Grainne. This means they can rely on regular Mac Lirs instead of investing in his more expensive Revenger counterpart, but risk losing early game skill options as a result. The subclan does benefit from quintet wall use as their primary vanguard options are legion pairs, but repeated use is questionable in light of the demanding counterblast requirements. No more than 2 quintet walls per deck is recommendable, and the presumption that quintet walls are necessary for witches can be argued to be one of the obstacles to the deck's success back in Japan. How often you'll have an opportunity to use early game skills is debatable. Grade 1 soulblasts are unlikely to go off on the turn that you would ride one of your sentinel-bearing cards, and 10000-power attackers usually make no difference on the first turn because most grade 1 vanguards will be at 7000 power in the current format. Hence, the only time that Graine activating subclan attackers will matter is against base 8000 vanguards, base 5000 vanguards and when the subclan attacker is boosted. For reasons discussed further down, it's a generally bad idea for witches to have a booster on the field on the early turns of the game, so as a whole Mac Lir is preferable to Grainne. For the grade 1 makeup there are about 9~10 slots to fill after Mac Lir and/or Grainne are accounted for. 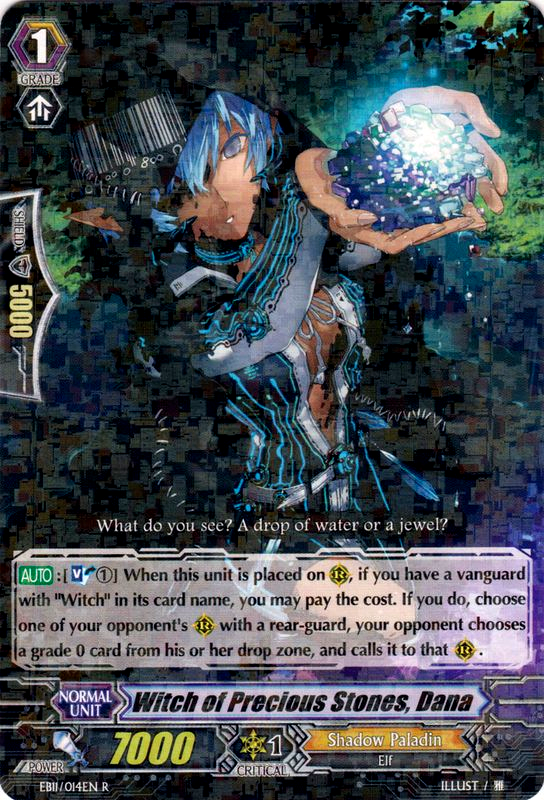 The witch deck's entire strategy relies on getting grade 0s onto the field, so Witch of Precious Stones Dana is a necessary playset. Her on-call soulblast 1 swaps a grade 0 of your opponent's choice from their drop zone onto their field. The caveat to this is that you need to get grade 0s into their drop zone, which provides an incentive for aggressive plays that will persuade the opponent to put cards into the drop zone through guarding. The subclan's grade 1 attacker Scathach can help generate this aggression, by exploiting the idea set in the opponent's mind that damage and defeat are one and the same. Her attack persuades the opponent to drop a trigger unit to avoid taking early damage, in the process exposing themselves to Dana and Fianna's curses in the following turn, playing off of the fact that they consider losing their field more acceptable than taking damage. Normally grade 1 attackers serve to get the opponent to drop a shield unit early that later on would have been used to defend an on-hit, preemptively activating that skill later on, but Scathach serves a dual purpose by making the opponent vulnerable to having their field controlled. Versus witches it's often better for the opponent to take damage than it is to guard at all, because the moment one starts defending with grade 0s they instantly become unable to play rearguards without losing them. The alternative is to defend with grade 1s and 2s, which removes useful rearguards from the hand while leaving less useful grade 0s still around, unable to be used either as rearguards or for legion. 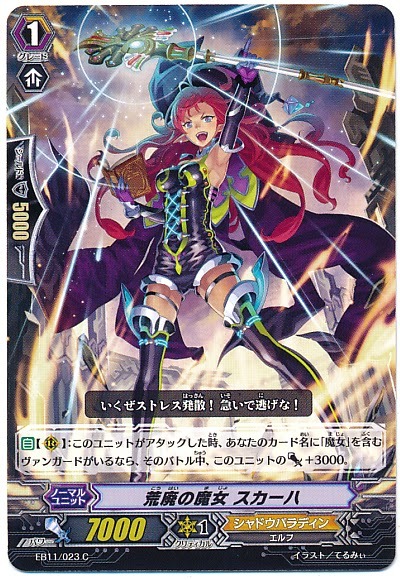 From Shadow Paladin's pool of existing witch cards, we have Witch of Nostrum Arianrhod. Arian is an excellent way to accelerate towards legion by card changing triggers into the drop zone in order to try and draw more immediately useful cards, but you need to be careful with this when planning around Lir because you should be expecting to have two free boosters out on turn 3 or 4. You should account for the idea that early on you will only have one booster called from the hand out, so playing multiple grade 1s early is not conducive to using Lir and Medb. If you don't do this and try to fill the field early to use multiple Arianrhod, Scathach or Dana, when it comes time to take advantage of what may be your only chance at Lir going off, the current field will be too clumsy to support it. When using Lir with a full field you'll stumble into calling a Medb over your existing rearguards, weakening your formation and preventing you from building a +1 off of Lir's skill. If the only open rearguard circles are the one behind the vanguard and in a column that already has a grade 1 on it, you may be forced to call over the rearguard column later. 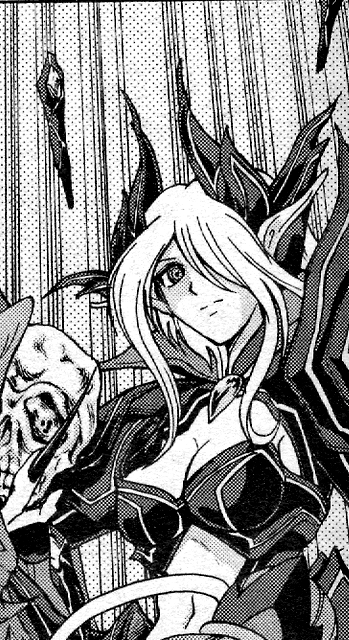 Phantom Blaster “Abyss” decks have successfully used Arianrhod in the same conservative way while running a playset of her, but four copies is not strictly necessary in this deck. Three can be sufficient enough to get her out regularly, especially since Dana's soulblasting can serve the same purpose. At the same time, using either Dana or Arian early game can clue the opponent in to the fact that they won't be seeing the other one anytime soon. Which one you use depends heavily on the kind of hand you draw into, and how well you can read into the current situation. Witch of Quests Securna is where things get complicated. 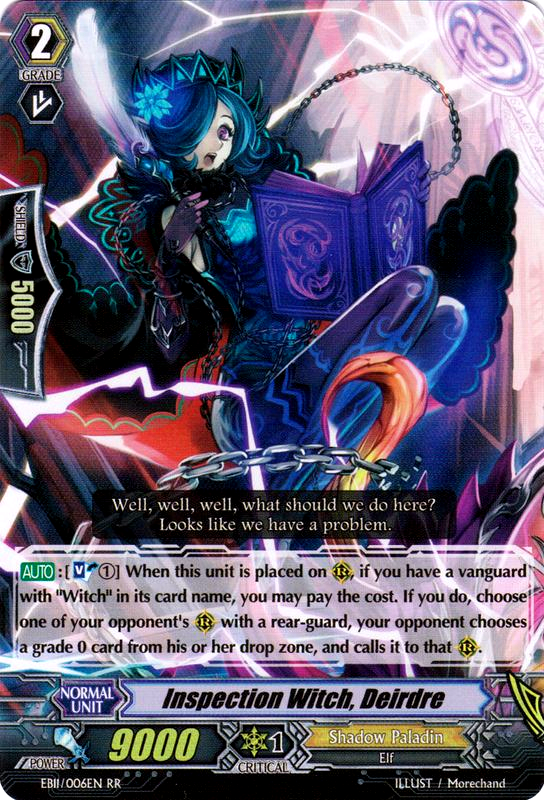 Her actual effect is to retire one of your other witch rearguards to give the opponent's vanguard -5000 power. While she can only be used if your vanguard is in legion and if the opponent has at least two grade 0 rearguards, her skill is actually useful at every point in the game in legion format because of how much more valuable each point of damage is. The deck's acceleration options mean she can go off as early as turn 3 or 4, and she's vital to on-hit skills. So you don't really want her at four copies, except that you do. At least three copies will help get her off consistently, but two is also an option, and how many you run comes down to individual experience. You also need to account for Securna's 6000 power base, which necessitates having either a 12000-power attacker or base 10000 power unit in front of her. For the grade 2 makeup, Witch of Reality Femme and Inspection Witch Deirdre are both necessary in some respect because they are each one half of the legion vanguards described above. Femme will typically be at 3 in decks that don't use stand triggers, but running Medb calls for an entire playset. 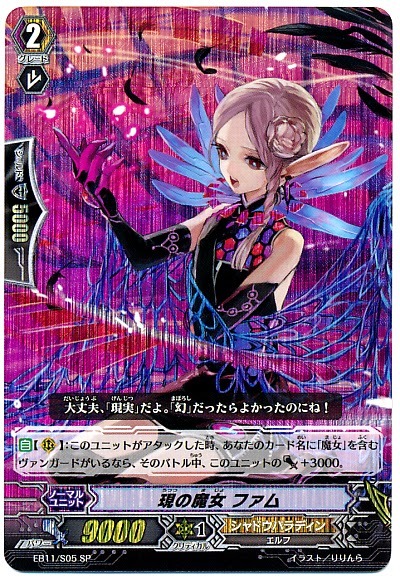 As the subclan grade 2 attacker, Femme is the only unit in the deck that can make the most of stand triggers versus the predominantly 11000 power bases of the current format. To a lesser extent she can also help build advantage with Fianna after legioning, being a target for Fianna's persona retire while in legion, but Femme will often bring more to the table by serving her offensive purpose on the field than in her defensive one in the drop zone. While she falls short of being as much of a threat to crossride units, the number of crossrides in the post-November game is severely diminished, so Femme will not be going out of style anytime soon. Deirdre should always be at 4 copies for the same reasons as Dana. Not only is she a primary method of getting 0s on the field and accelerating for legion through her soulblast, because of how limited your early game calls are Deirdre is arguably the primary method before you hit legion. The remaining grade 2 space is a contest between Adora and Nemain. Witch of Attraction Adora is the one witch that the English format has yet to see. 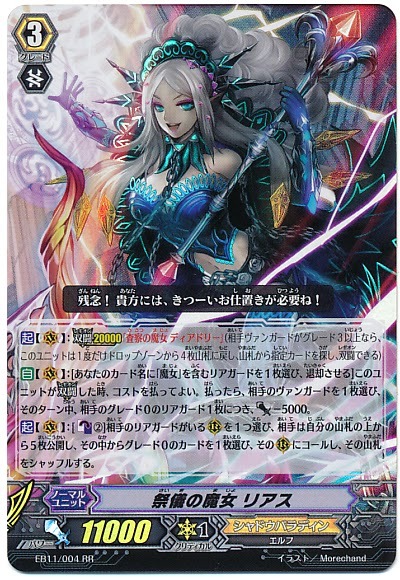 Released as a promo card in part of Cardfight Pack 14 in Japan, and expected to be released in Pack 12 in English, Adora is the first in the witch series to require especial counterblast. When her attack hits a vanguard, her counterblast 1 reveals the top 5 cards of the opponent's deck and forces them to call a grade 0 unit from there over an occupied rearguard circle of your choice. Adora effectively achieves Rias' skill for less counterblast in exchange for being an on-hit, and synergizes well with the witches' existing impetus to make early attacks that capitalize on their stand triggers and get the opponent to drop shield before Adora comes out. Her primary weakness is the especial counterblast cost, which limits your trigger pool much more significantly and encourages using witch quintet walls over non-witch Mac Lirs. Adora is an ideal early game ride and a counterblast that you don't have to dedicate to until your attack hits, and unlike the other non-legion support she's live the moment she hits the field, so you don't have to wait for an opponent to defend with a grade 0 first. The Witch of Attraction is not out yet however, and that leaves one last witch to consider; the original. Skull Witch Nemain is a familiar card to veteran Shadow Paladin cardfighters, designed as the perfect sacrificial target. 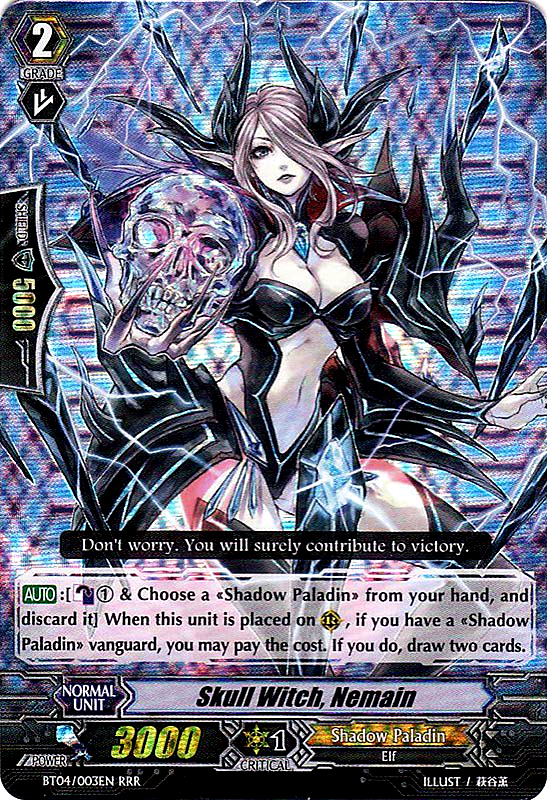 On-call Nemain can counterblast 1 and discard a Shadow Paladin to draw two cards, turning herself into a +1 that can be used either as an interceptor that benefits from the opponent's crippled rearguard lanes only attacking in the ballpark of ~11000 power, or into a retire target for Rias and Securna. 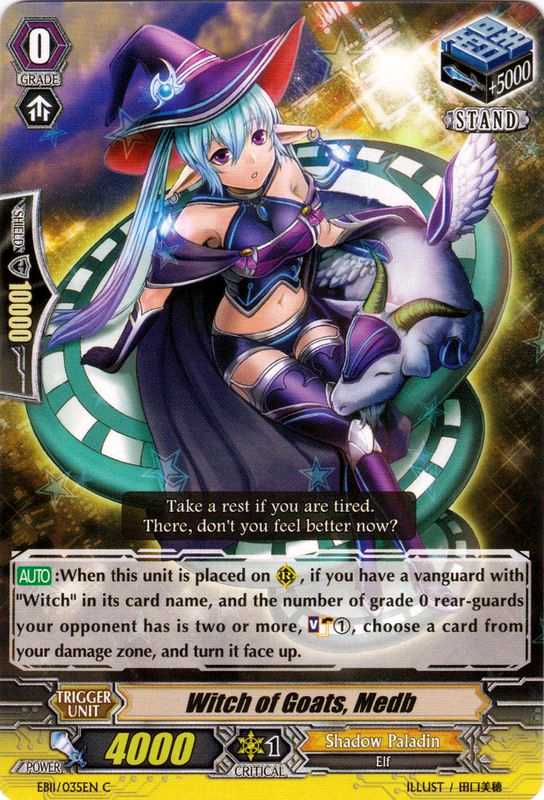 She's helpful in setting up legion, as every use of her represents two cards in the drop zone, both herself and her discard target. While Nemain can support either stand or draw decks, she and Fianna together make draws somewhat redundant. Conveniently Nemain has been reprinted as a single rare in EB11, but the old triple rares and special parallels are just as usable. She has also aged well compared to the rest of BT04's card pool. Nemain's weak 3000 power base, so low that no other grade 2 in the game has anything on part with it, has been overhyped for what it can do to your turn 2 ride. The reality is that most opponents will not have the optimized hand for filling the field if faced with her, and trigger rushing leaves them exposed to activating your Securna and Rias for you further down the line. Her strengths outweigh her weaknesses. The opponent seeing you ride her also lulls them into a false sense of safety, causing them to believe they have already won based on these early turns when they ought to have their guard constantly up against a witch deck. Overall the witch series is more difficult to play but also more rewarding than their Revenger counterparts. A witch deck played poorly will do significantly less than an “Abyss” or Raging Form deck played poorly, but a witch deck played well will exceed their contemporaries in every respect. The subclan is made and broken by the skill level of the cardfighter commanding them, requiring unorthodox planning around grade 0 calls and an appreciation for the properties of legion. Those more familiar with the Revengers will find themselves challenged and potentially turned away by the witches' opaque card skills, but seasoned Shadow Paladin cardfighters that first cut their teeth on Phantom Blaster or Ildona will find themselves right at home with the mix of advantage-based play and careful consideration of costs. As with their predecessors, there is no direct "win condition" compared to the competing restand decks within the clan, but a combination of related skills that can each push the game in their own respect, until you've won before the opponent can ever realize it. November 16th, Kyoto, Japan. Almost a year ago Nouvelle Vague and Cecilia Musketeers were making headlines having topped at the first Kansai Vanguard CS; now in its fourth iteration, the championship series returned to its roots at hobby shop Yellow Submarine. Located on the fourth floor of a vertical stripmall comprising other small businesses like a pork ramen shop and nail salon, Yellow Submarine has been a permanent fixture in the area since 2009. The preliminaries at the fourth Kansai CS consisted of four rounds of Swiss draw, followed by a cut to top 16 with tournament brackets implemented. Both the preliminaries and finals had a 40 minute time limit and followed a best of 3 games format. 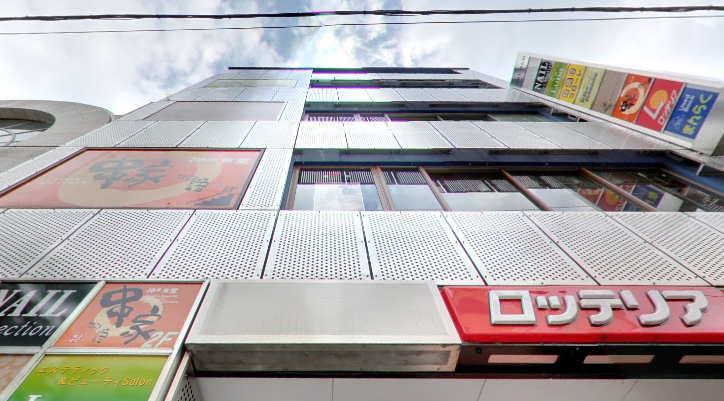 Starting at noon and closing at 7:40 PM Japanese time, first place was rewarded with a voucher guaranteeing them six boxes of the most recent booster set, while second, third and fourth place received vouchers for four, three and one boxes of the same. The vouchers become valid on December 5th 2014, on the release date of VG-G-BT01: Generation Stride. 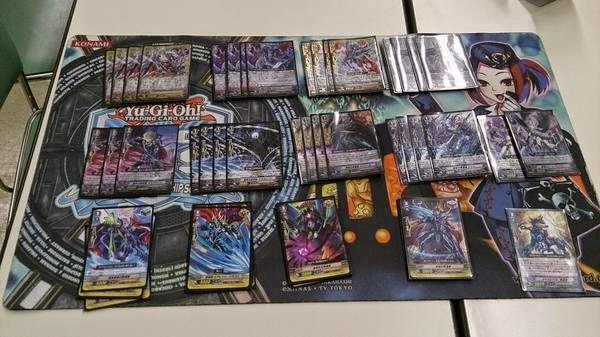 While first and second were both Phantom Blaster “Abyss” decks as typical of recent tournaments, the most striking development by far was Shokushu in fourth with a Star-vader deck--the first such Link Joker top since Glendios dissolved at the end of the last Japanese national tournament. Shokushu had previously finished second with Thing Saver at the Kin no Shacchi CS, above where Mirutae had in that same month. At Kansai he placed using Dark Zodiac from BT17 as his primary grade 3, with the trial deck card Garnet Star and MBT01 boss Blaster Joker as supporting units. Garnet Star was chosen as the alternative grade 3 due to the constraints legion mechanics place on deck space; Garnet and Joker share their legion mate Photon, and Joker can be searched from the deck using the grade 2 Dilaton, allowing Garnet to effectively stand in for the other unit because of Joker's exorbitant counterblast cost. Garnet's on-legion skill actually sets up the conditions for Dilaton to activate by locking two of the opponent's rearguards, and with all of these factors in mind Joker has an immense amount of synergy paired with Garnet. While Joker can be a powerfully disruptive play by retiring the opponent's legion mate, and with its field lock can actually prevent “Abyss” from being able to set up early on while powering up Lanthanum by up to +15000 power, the card is also dead weight once either counterblast or soul are exhausted and is a poor early game ride. To avoid that early game Shokushu designed the deck with Garnet and Dark Zodiac as his primaries. 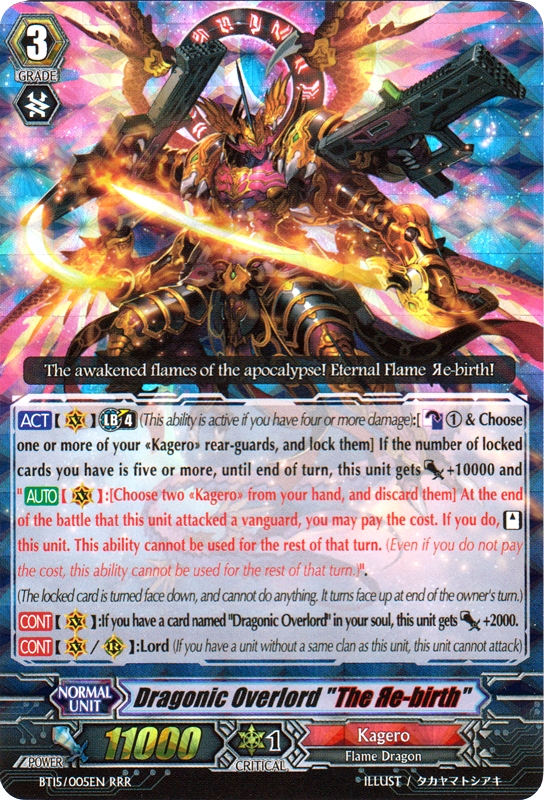 As with Garnet, Zodiac's persona blast locks a frontrow and backrow rearguard, while its on-legion counterblast prevents the opponent's cards from unlocking during the end phase of their next turn, resurrecting the powers of “Ω” Glendios without being reliant on a pool of “Яeverse” units to maintain those locks. 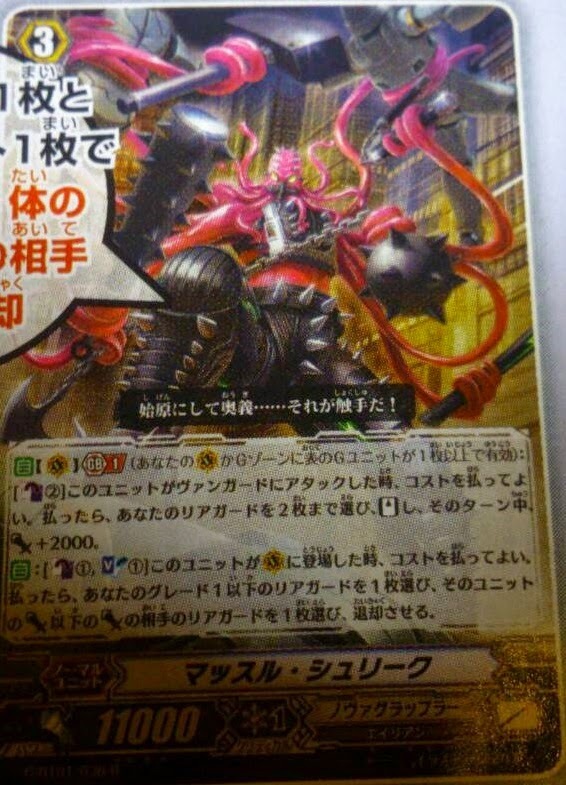 During the peak of Thing Saver-“Abyss'” reign Zodiac was unpopular due to a combination of its lock skills being ineffective against a vanguard capable of attacking three times in one turn, Glendios having Rubidium to completely nullify Thing Saver's strategy by redirecting his attack to a rearguard, and the general strength of Perdition Dragons versus the Link Joker matchup. With Blaster Joker available as a dramatic turnaround card capable of shutting down the Kagerou matchup and slowing down a game in a single turn, Thing Saver's restanding abilities curtailed by the September 29th restricted list, and Phantom Blaster “Abyss” as the primary threat of the format, the conditions are right for the Star-vaders to become prominent once again. Minorun and Mirutae's Revenger decks are notably identical, and share a very similar structure with those that topped at the fourth Sapporo VGCS and second Brave Cup. Overall the present format appears to have stabilized in the Revengers' favor. They accounted for approximately 31% of the entries at Kansai, between the Brave Cup's 23% and Sapporo's 33%--enough to hold a majority over competing decks, and almost enough to constitute a perfect third of tournament results. Kagerou is the most significant opposition, with Dragonic Overlord the Great as the current contender. Thing Saver Dragon continues to haunt the background of these tournament results, but with Seeker support mostly cut off in upcoming booster sets, it's doubtful that the deck will ever fully recover from the Neon Messiah-on format shifts. Invitational top 4. Original image posted by William Steele. November 15th, Rochester NH. Local card shop Jetpack Comics held an invitational tournament set out to commemorate the Cardfight!! Vanguard trading card game's two year anniversary at the store. Having sent out its call for signups in late October, the main event attracted 43 cardfighters in total. A team tournament was also held, in which five three-person teams took part. 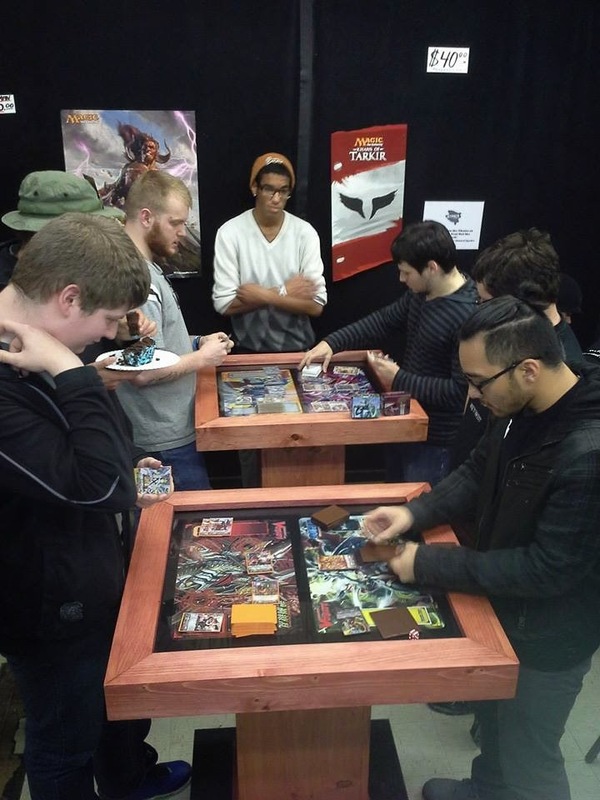 The invitational tournament was the debut of the shop's fight tables, a series of standing glass-topped tables with official Bushiroad playmats set inside of their displays. The tables were custom made for the event, and debuted during the top 4 playoffs. First place at the invitational was taken by Christian Nguyen with a Nouvelle Vague-Dragonic Overlord “The Яe-birth” deck, while second place went to Jesse Newman with pure “The Яe-birth,” third to Matthew Lilley with Nouvelle and fourth to Mandon Healy-Rindfleisch with a Galaxy Blau series deck. 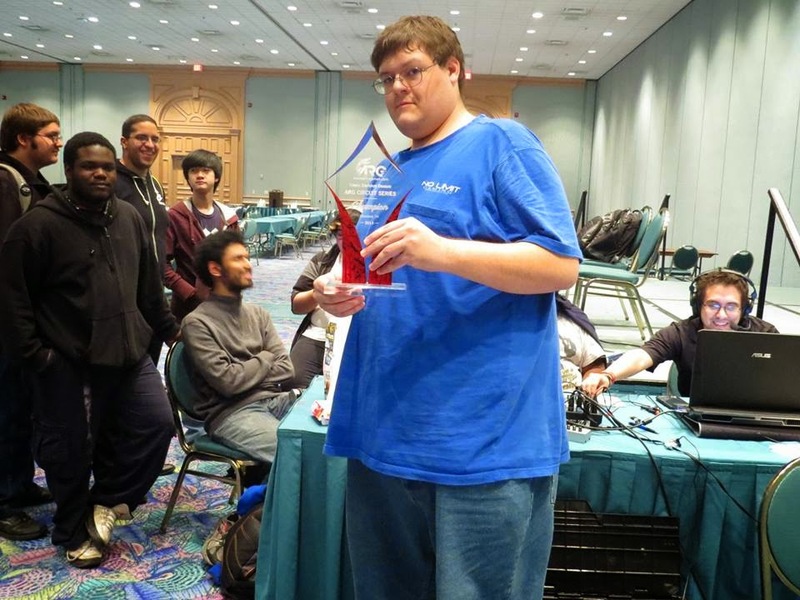 Earlier this year Lilley had placed second at the WCS2014 New York regional qualifier, also playing Nouvelle. Decklists are provided below. 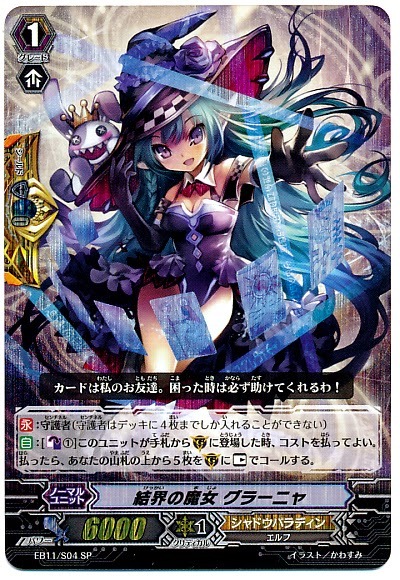 Similar to Japanese play post-BT15 but counter to existing trends in the English-language format, Kagerou dominated the invitational with the support from Nouvelle and “The Яe-birth.” Pale Moon is a specific innovation of English-language play that was not observed in Japan; the popularity of Venus Luquier is owed to the general lack of enthusiasm with which Omega Glendios has been approached by international cardfighters, as without a specific counter to it running around in the format Venus is free to build 40000+ power Upright Lion lanes that effectively restand through Eva's breakride skill and abuse of Silver Thorn Assistant Zelma. Organizer Nick Steele also preemptively announced the New Hampshire Cardfight Circuit, a quarterly tournament series held at the end of every NH tournament season, and hosted by officially sanctioned stores in New Hampshire. The first NH Circuit is set to begin in December, with further details forthcoming from its organizers. Hokkaido citizens' activity center, Sapporo city. Over November 2nd the fourth Sapporo city VGCS took place, attracting seventy participants in total. Won by Igachuu, a new face in professional play, the tournament results followed up on recent trends established at the second Chiba Brave Cup. The tournament was primarily made up of Shadow Paladin cardfighters building their decks around the Revenger subclan, many of them having transitioned to it after abandoning Thing Saver Dragon following the implementation of the most recent restricted list. Entry fee at Sapporo was 1000 yen (approx. $10 US) per person with payout to the top 4 cardfighters, with first place winning a the newest model of Nintendo 3DS XL, second place four copies of whichever Beginning Set of their choice, third place two copies of the same, and fourth place two boxes of VG-MBT01: Neon Messiah. As per current rules for mainstream play, G-units and their accompanying stride mechanics could not be used. Tournament format was five rounds of Swiss draw, followed by a four round cut to top 16, with 50 minutes per round and best of three (in Japan recognized as the first to two wins) ruleset in place. The tournament used clan fight rules to prevent mixing of multiple clans in each deck, and lasted just over ten hours from the beginning of the first round at 10:45 AM to the closing ceremony at 8:30 PM. The top 4 decklists are provided below. While the preceding Brave Cup saw a narrow Liberator victory from the tournament's few Gold Paladin cardfighters, Sapporo city saw more traditional results from the dominant player base. Revenger fighters far outdid their Perdition counterparts, becoming the most prevalent group represented. 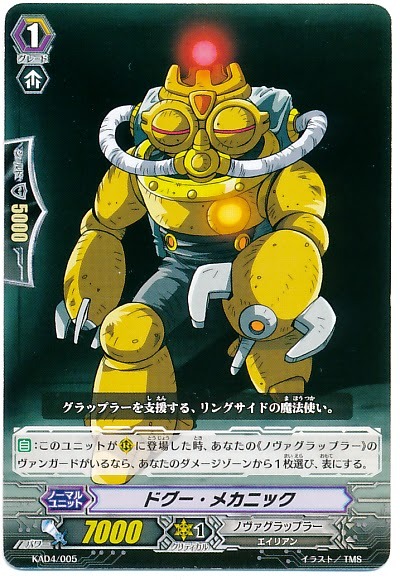 “Abyss,” which was just feature as the English card of the day this morning, has filled the gaps left by Thing Saver in pro competition, is primarily characterized by its high power restand that tends to exceed the swings of even Minerva and Nouvelle of past tournament seasons. While counterblast heavy, “Abyss” has access to an unflipping engine from the base Blaster Dark Revenger and his supporting grade 1 Dorint. By eschewing Dark Revenger's retire skill entirely and exploiting Dorint purely for his unflip, the break ride central to “Abyss'” high power restand becomes counterblast-free. Later in the fight damage expended for the restand skill can be partially recouped by calling these cards from hand to sustain additional restands in the long term. As at the Brave Cup, Blaster Joker continues to be absent in spite of it being feared as a major competitor in the current competitive format. An explanation may be drawn from its lack of truly aggressive means of winning games. Unlike the majority of deck options in the format, Joker does not have any kind of aggression approaching the level of a restand or guard manipulation, and its expensive skills can generally only maintain locks for two to three consecutive turns before petering out. Note that there is an error in ☆Shinamon's Japanese decklist; it only lists 49 cards. Based on a photo of ☆Shinamon's decklist, this missing card is a second Sword Breaker. 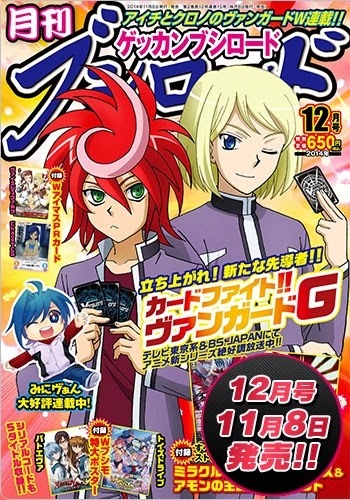 This morning issue 15 of Monthly Bushiroad magazine was leaked by vendors in Japan, two days ahead of its street date. The issue was packaged with the promotional card Amon's Mastermind Astaroth, and revealed cards from the upcoming set G-BT01: Stride Generation, which will debut in Japan on December 5th. The new Oracle Think Tank units focus on adding one card from the top two of the deck to hand and sending the other to the bottom, while the Gear Chronicle units focus on sending the opponent's rearguards to the bottom of their deck and alternatively blocking either grade 1 or grade 0 guardians. 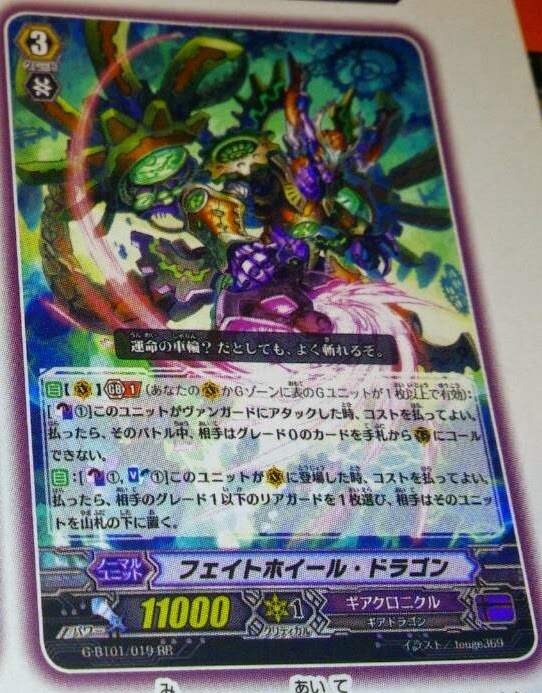 The marquee card of the issue is the Interdimensional Dragon, Ragnaclock Dragon. Designed by veteran artist Amemiya Keita, Ragnaclock is a G-unit like Harmonics Messiah before it, that cannot be placed in the deck and instead has to be stridden from the generation zone. Amemiya had previously illustrated Werwolf Sieger, Dark Lord of Abyss, and Knight of Purgatory Skull Face. 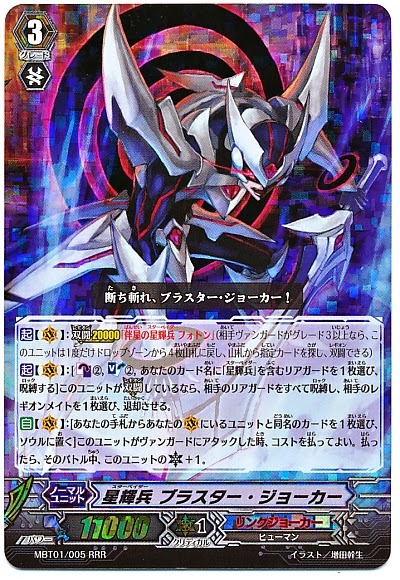 Ragnaclock's counterblast 1 activates when it attacks a vanguard; by turning a copy of itself in the generation zone face-up, it prevents the opponent from calling grade 0 cards to the guardian circle from their hand, and if his cardfighter has two or more units face-up in their generation zone Ragnaclock gains an additional critical. Accounting for the power gain from the grade 3 it strides over, Ragnaclock's final in-battle stats will be approximately ~31000+ with 2 critical, lifting inspiration from both Dragonic Nouvelle Vague in limiting the opponent's guard options to units with 5000 shield, and from the mixed critical and guard control legions of the previous format. Similar to a persona blast in design, Ragnaclock's generation skill is fundamentally limited to activate only twice per game, but G-BT01's introduction of the Gear Chronicle stand trigger Waku Waku Worker will change this. 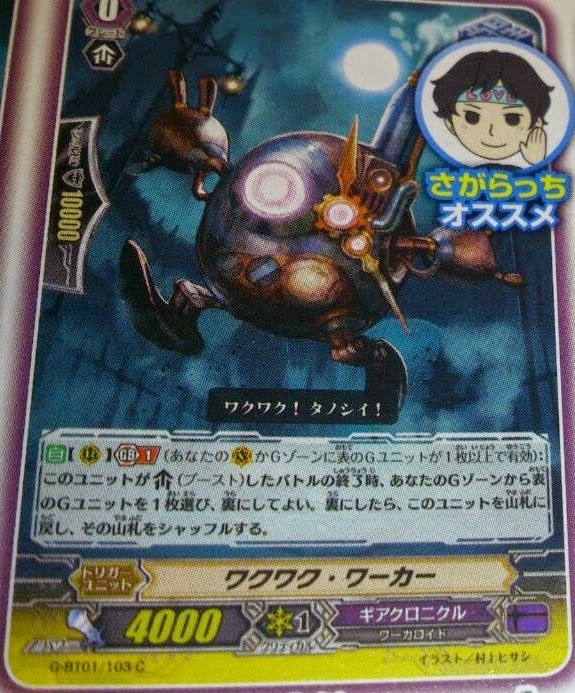 Waku Waku's generation break 1 lets it turn a unit in the generation zone face-down after it boosts in exchange for sending it back to the deck at the end of that battle. GB1 skills will activate even if the G-unit on the vanguard circle is the only face-up generation unit, which allows Waku Waku to begin doing its job immediately, ensuring that Ragnaclock's persona generation is limited only by the number of times Waku Waku can be brought out. Since the onset of legion format in BT16, skilled stand triggers have been a favorable alternative to draws, and Gear Chronicle's Luck Bird clone Steam Scalar Gigi will make this more viable. As a whole Gear Chronicle is more clearly coming into its identity as a Dark Zone clan in the set, with multiple soulblast options in the vein of Spike Brothers. While G-BT01's set contents are not fully known, there is by comparison a dearth of soulcharging options, currently limited to riding over the clan's legion pair Ruin Disposal Dragon and his mate Steam Knight Puzzle Iri. Following up on Gear Chronicle's other primary mechanic, Ruin Disposal is able to send an opponent's grade 2 or lesser rearguard to the bottom of their deck when it legions. Meanwhile Iri operates under similar conditions as Ragnaclock. In the rearguard Iri can soulblast 2 when it attacks to prevent the opponent from guarding it with grade 0 cards, acting as a Silent Tom with higher base power. While Iri is likely here to stay as a primary grade 2 option for the clan, Gear Chronicle fighters will find themselves hard pressed to fit Ruin Disposal in. 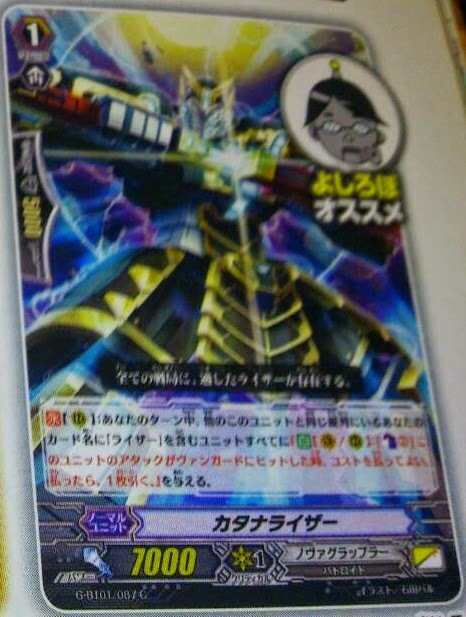 The clan's existing grade 3 from G-TD01, Chrono Jet Dragon, automatically blocks both perfect defense cards and quintet walls when it attacks a vanguard while at generation break 2, and with Ragnaclock's self-flipping cost accelerating Chrono Jet is going to be very easy. 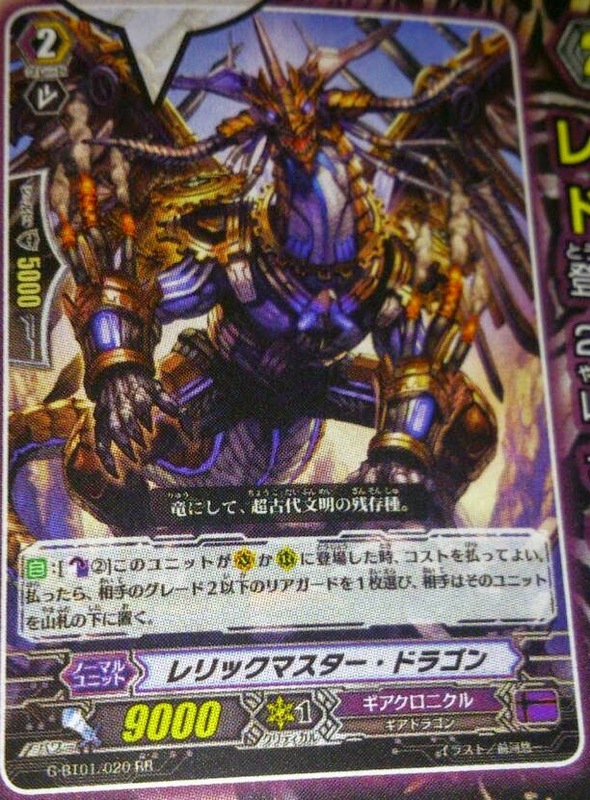 Furthermore, G-BT01 is introducing a complementary grade 3, Fate Wheel Dragon. Fate Wheel's on-ride counterblast 1 soulblast 1 dismisses any of the opponent's rearguards forward in time to the bottom of their deck, while his generation break CB1 blocks grade 0 cards in the same style as Ragnaclock. Paired with Chrono Jet's combination of on-stride rearguard removal and guard control, Gear Chronicle's grade 3 and 4 lineup has multiple ways to aggressively control the two most important defensive resources in the game while utilizing their soul as a primary resource where other clans would have to pay higher counterblast costs instead. 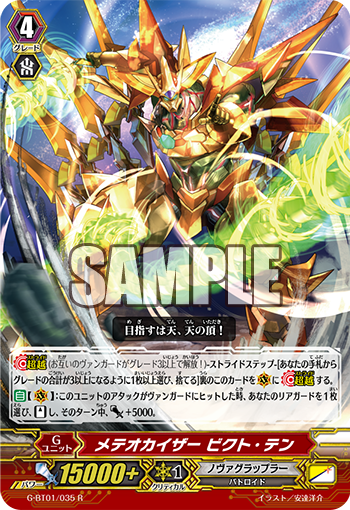 G-BT01 is also capitalizing on Chronicle's field control options, with the grade 1 Gear Wolf's generation break 1 giving it +3000 power every time a unit is sent to the bottom of the deck by a Gear Chronicle's skill. This allows for Nebula Lord-style rearguard columns, attached to cards like Iri that block grade 0s, forcing the opponent to stare down a potential ~22000 power rearguard lane that requires either a perfect defense card to block while the vanguard is demanding the same. Key to Chronicle's striding strategy is the grade 1 Steam Breath Dragon, who when discarded to pay the cost for stride increases his own grade by +2. This effectively turns Steam Breath into additional grade 3s, allowing him to be easily cycled out for Ragnaclock or Mystery Flare, the clan's trial deck stride. 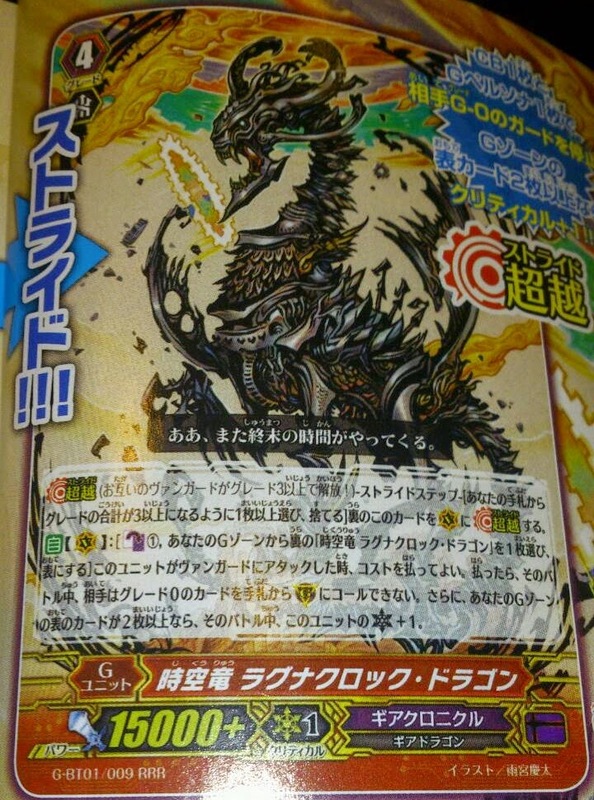 Finally, Gear Chronicle's grade 2 lineup is rounded out by its own twist on the Berserk Dragon formula, Relic Master Dragon. For counterblast 2, Relic Master dismisses an opponent's grade 2 or lesser rearguard to the bottom of their deck, which by following up from Fate Wheel or Chrono Jet can pump Gear Wolf into a 13000-power booster. While costly relative to the other Chronicle cards and making for a tight damage zone in a clan with no unflipping options, Relic Master belongs to the same family of grade 2 control units as Gwynn the Ripper, that have defined and sometimes broken other clans in the line of professional competition. 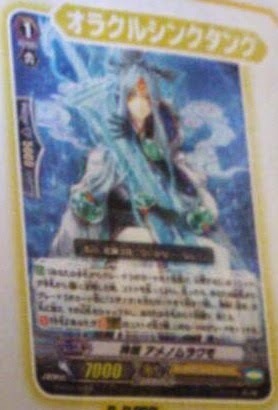 This issue also confirmed additional support for Oracle Think Tank's emergent Susanoo and Battle Sister subclans. For Susanoo, the Steam Breath Dragon clone Battle Deity Ame no Murakumo's on-call skill searches for grade 3 Susanoo units. The grade 3 clause prevents it from searching Susanoo's grade 2 incarnation, preventing it from aiding Ohirume legion decks. Meanwhile Battle Sister Mille-Feuille's on-ride skill is a modern implementation of Monaka, Parfait and Cookie's basic +1s, drawing a card for counterblast 1 soulblast 1. Her generation break 1 is to counterblast 2 and add one card to hand from the top 2 cards of the deck, then send the remaining card to the bottom, a generation break variant on Heaven Conquering Battle Deity Susanoo's on-stride skill. 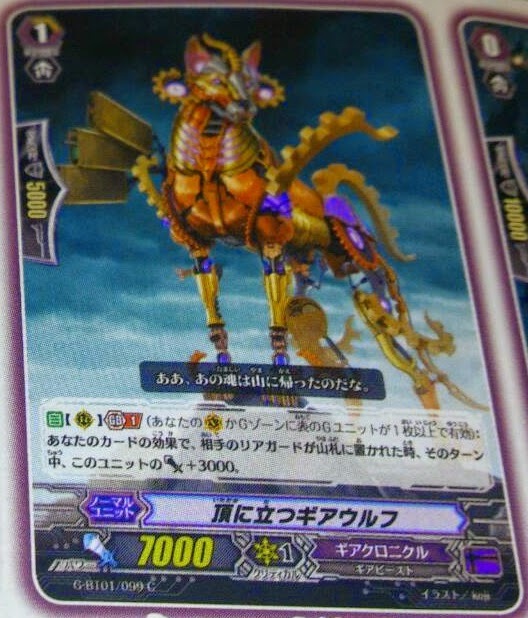 Oracle Think Tank will also be getting its first stride unit, Auspicious Beast That Soars Through Heaven, Kirin. Kirin's on-hit skill has the same effect as Mille-Feuille and Susanoo, but is costless in exchange for being an on-hit. With the strong power boost of a stride unit that can be activated early game and triple drive backing it, the on-hit is much easier to get through compared to limit break or innate grade 3 skills. Accompanying the Nova Grapplers' upcoming Mecha Battlers in Stride Generation is mixed support for the Raizer and Beast Deity subclans. While the Beast Deities have already been announced to receive a limit break enabler in Frog Master, the Raizers are now benefiting from a new advantage-focused grade 1. Katana Raizer's continuous rearguard skill gives an on-hit CB2 draw skill to both itself and all Raizers in the same column as itself, giving the mostly counterblast-free subclan better draw consistency and pressure attacks. Nova's clanwide boss card Muscle Shriek has an on-ride with the same cost as Mille-Feuille above, to retire an opponent's rearguard with same level of power as one of Shriek's grade 1 or lesser units. This makes Shriek the first Nova Grappler with true field control, able to take out the opponent's boosting units; its generation break 1 stands two rearguards for counterblast 1 and gives them +2000 power each, ensuring one to two more attacks that always strike for more than the preceding blows. 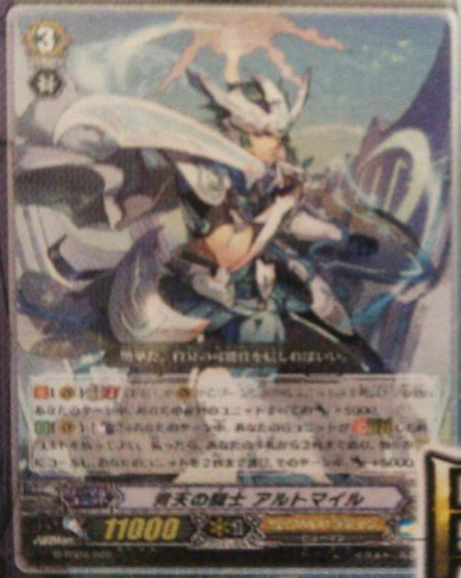 Royal Paladin's stride unit, Sacred Dragon Saint Blow Dragon, is a revitalization of the old King of Knights strategy. By turning a copy of itself in the generation zone face-up during the main phase, Saint Blow receives 3000 power for every rearguard in play, and if there are two or greater rearguards along with two or more face-up cards in the generation zone, Saint Blow gains an additional critical. 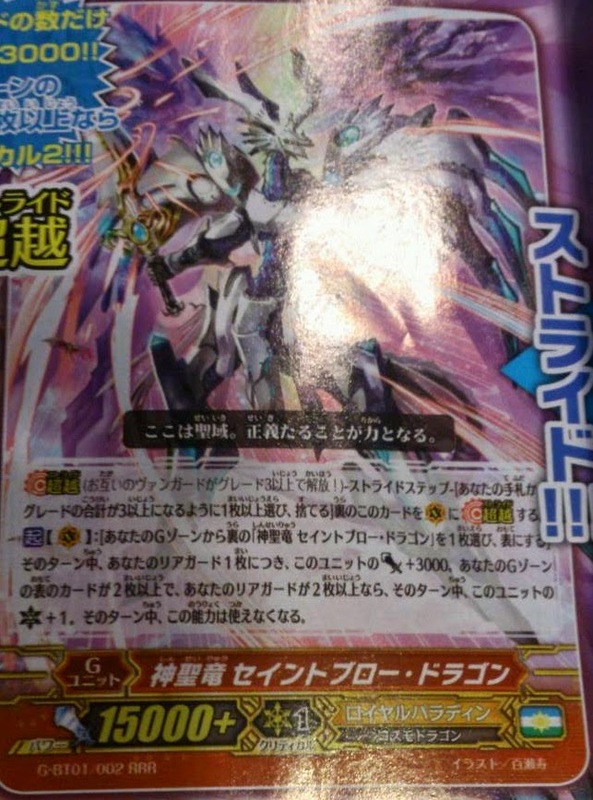 Saint Blow is intended to be complemented by the trial deck card Knight of Blue Heavens Altomile, who follows the traditional Soul Saver/Sanctuary of Light formula. On-stride Altomile's counterblast 1 allows two cards to be called from hand, and then for two units to gain +5000 power. While not required for the rest of the skill to complete, the hand calling is done to cope with the specific timing of the stride step, which takes place after the ride step but before the main phase. In the current format it's feasible not to have two rearguards to give power to after striding, so by accounting for this factor Altomile overcomes Soul Saver Dragon's old weakness. Furthermore, Altomile's generation break 2 strengthens the rearguard lines by +5000 power, providing an endgame after copies of Saint Blow are exhausted. Combining the two creates a high-power center lane in the style of classic Alfred, alongside strong rearguards. Typical numbers post-stride would look like ~21000 power for both rearguards, and 41~48000 2 critical for the vanguard. The issue was closed with the debut of a new original unit, the winner of 2014's contest submission. 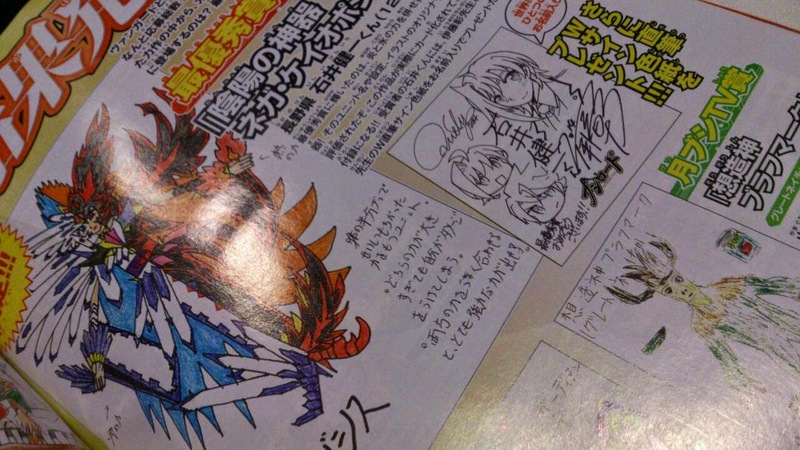 Like Avectro Zeus before it, "Regalia of Yin and Yang Nega Keiopojishisu" (陰陽の神器 ネガ・ケイオポジシス) is designed by one of Monthly Bushiroad's child readers as part of a submission contest, and will be made into a promo card for an upcoming issue.